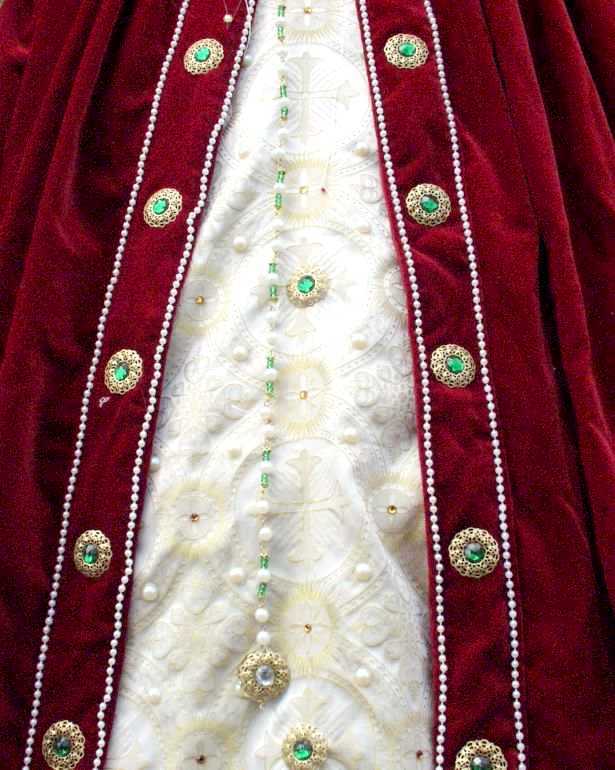 The girdle is probably the simplest thing on the whole gown except of the smock. …pearl, pearl, stone, pearl, pearl, middle piece with triangular stone, pearl , pearl…. and all of this can be done with usual things that can be bought in any crafts shop (which should, of course, vaguely be affiliated with jewelry making). 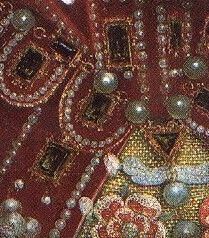 However – the original girdle has something in it that vaguely looks like a ‘long’ version of the square decorations of the bodice. 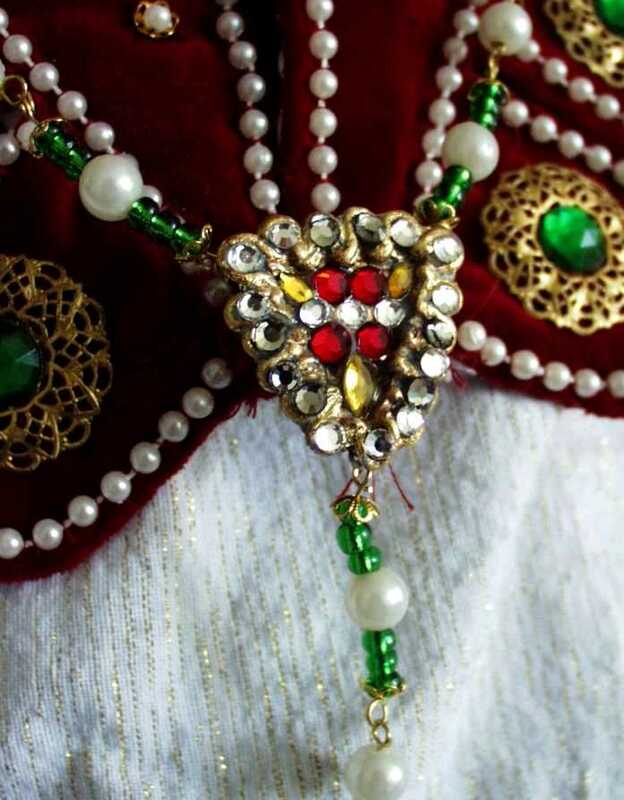 As I could not obtain something like that, I thought of a possible beading pattern and then worked with emerald green glass beads, golden bead caps, white pearls and golden thick jewelry wire. The triangular front middle piece was made with Fimo; three wires with eyes embedded into it firmly to hold the three strands of beading. I furthermore leaf-gilded and decorated it with Swarovski rhinestones and navette shaped acrylic jewels. The colors were chosen in a way that they would match the Pelican gown. 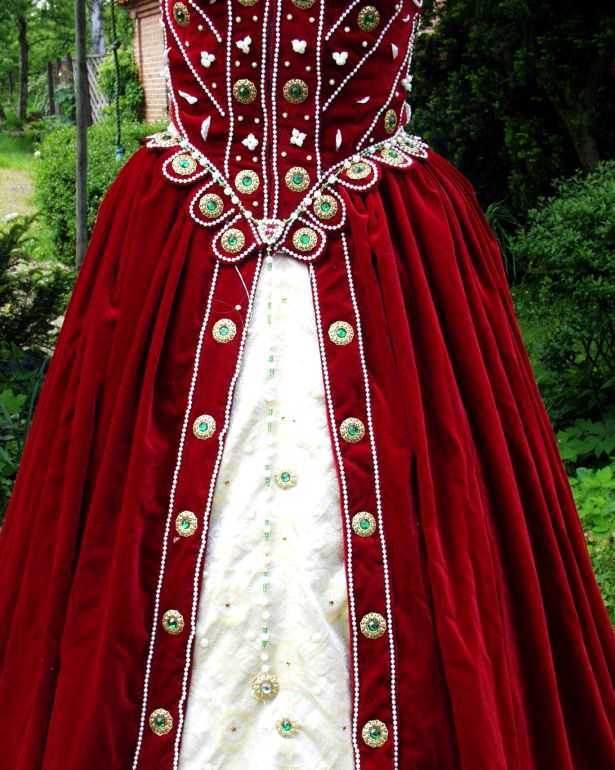 I think I’ve overdone it a bit; but then – can one *overdo* something on an Elizabethan court gown? 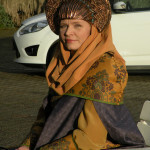 The following picture shows the ‘jewel’ at the front end of the girdle quite well. I’ve basically simply taken two of my golden disks with clear stones, attached them to each other by their backs and then hooked them to the girdle end by the means of a tiny golden ring. The last item of jewelry for this gown are the wristbands.